After one of my recent speaking engagements, a gentleman came up to me to chat. He told me that he worked for the government in kind of an undercover capacity. I was intrigued and started asking him questions. Well of course, he couldn’t tell me too much! He told me that when he does undercover work, he has to have some type of “cover” so people won’t know what he is really doing. He told me that he chose to be an open air preacher and to hand out tracts as his “cover!” I stood there almost stunned. I said that you get paid every day to preach the gospel and hand tracts out, but that really isn’t your job?! I loved it. What a fantastic idea. I asked him how he got away with that as a “cover.” He told me that he was the boss, and he could make that decision! My kind of boss! The whole conversation really got me thinking. What really got to me was that for many of us, we do just the opposite. We are salesmen, who happen to be Christians. We are mothers and fathers, whose faith is only seen on Sundays. We are plumbers, but our customers never know that we read the Bible. We are politicians, but we don’t want to mix our faith in with our job. We are teachers, but leave our Christianity at the front door with the metal detector. We are students, but think we don’t need to raise our hands up to speak against the false teachings that are being propagated on college campuses. We are, and you can fill in the blank, but yet we are keeping the most important part of ourselves, our relationship with the Almighty God, to ourselves. So when this world is in desperate need of eternal truth, it comes down to the fact that we are scared or ashamed and that it is really not my job to tell these people anyway. Wrong! Once while I was still teaching, I had to hire a guy to speak at an athletic banquet, so I hired this ex-Major League Baseball player. It was a Christian school, and we wanted someone with a strong testimony to challenge the students and parents to boldly stand for Jesus Christ. So, I asked him what he was doing for a living. He told me that he worked for a cable company and installed cable TV in people’s homes. I asked why would you be doing that? I am not the smartest guy in the world sometimes! I thought that every ex-pro athlete should be rolling in the dough. And of course reality is very different from our perception. He looked at me and said, the reason I install cable TV is to get into more people’s homes so I can tell them the truth about eternity and the truth about the crucified Savior of the world. I can’t even begin to tell you the feeling I had inside of me when he told me his story. It was one of the most humbling moments of my entire life; this man had life figured out. It isn’t that you go and lay cable to feed the family and pay the bills, but that you go into people’s homes to plant seeds for the Lord Jesus Christ, and at the same time God allows you to get a paycheck. As the New Year begins, I want to encourage you not to be an undercover Christian in the coming days. Make sure it is the part about you that most people know first and foremost. Oh by the way, the government person who was undercover told me that one day he got the chance to hand a tract to the terrorist that he had been following! Even he knew that jail doesn’t change a man’s heart, but the gospel does. Make sure no one around you in the coming days will ever mistake you as an undercover Christian. Be bold! continue reading "Giving Up or Letting Go?" We are also required to keep our covenants and vows, especially the one of marriage. Do you need some help to get re-focused? This article entitled 'Out of Focus' by Lynn Mosher of Heading Home will help you to 'see clearly' once again. 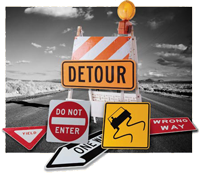 continue reading "Is Your Vision Blurry..."
Is there anything more frustrating when you are on a trip than encountering some sort of detour? You have a schedule and plans, and the detour, the construction, the re-routing, the heavy traffic – you just know that you are going to be running late, and that all of your well-made plans will now be turned upside down and inside out. I must confess, it is times like that when I tend to be more “in the flesh” than any other time! Patience in traffic situations is something that continually is my prayer need! But, the reality is, there is no avoiding these obstacles in life. In so many places, at so many times, the unexpected comes up, and our anticipated activities are rearranged in a way we hadn’t expected. Traffic tie-ups are minor things. What if your obstacle is an unexpected illness? Or employment termination? These and so many other “obstacles” can and will come up in our lives. When they do arrive, do you fall apart – or do you have the victory? Even in unexpected ways, along paths we had not anticipated, the Lord will never leave us nor forsake us! He will design and use what we may have thought were obstacles to bring us exactly where and how He wants us! Are you facing obstacles in your life? Please be advised: Messages over one year old will be deleted. Please download and save as an mp3 file. continue reading "Victory Over Obstacles"
by the ONE who knows your heart. Do you find it difficult to BE STILL? continue reading "I Will Be Still And Know You Are God"
I needed to hear this tonight. *There's an old fable that says the devil once held a sale and offered all the tools of his trade, to anyone who would pay the price. They were spread out on the table and each one was labeled. Hatred, malice, envy, despair, sickness, sensuality -- all the weapons that everyone knows so well. But off to one side, lay a harmless looking wood-shaped instrument which was marked "discouragement." The instrument marked discouragement was old and worn looking, but it was priced far above all the rest on Satan's tools. When asked the reason why, the devil replied, "Because I can use this one so much more easily than the others. No one knows that it belongs to me, so with it I can open doors that are tightly bolted against the others. Once I get inside I can use any tool that suits me best." Many people today do not realize one of the greatest tools of Satan used against Christians is discouragement. When one becomes discouraged, it give the enemy an opening to place thoughts in their mind that exalt themselves above the knowledge of our Lord Jesus Christ. 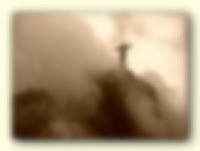 Once Satan gets a foothold in one's mind by sowing thoughts, he is on the way to gaining a stronghold. Discouraging thoughts sow seeds of doubt, oppression, depression, and can cause one to have anger or resentment toward others. Recognizing the source of discouragement will help avoid falling prey to schemes of the enemy. Satan is out to discourage those who are doing their best for the Lord. His plans never stop with discouragement, as his goal is to kill, steal, and destroy. We cannot afford to entertain his thoughts or criticisms which he tries to sow. We are children of the King, our hearts look to Him and rejoice in His love. Our Lord delights over us with singing. There is still power in the blood of Jesus to defeat all the forces of evil. It has been said that the thoughts which depress Christians are like bricks or weights, joined together one by one, until they become like a "yellow brick road" leading to one's heart. We are to cast down every high thought and vain imagination that is lifted up above the knowledge given in God's Word. Knowing 'who we are in Christ' can prevent us from being deceived by the one who is out to destroy our souls. There are many other schemes which Satan uses against God children. We must always remember, "no weapon formed against us shall prosper" if we are obeying the Lord. He never told us that weapons would not be formed. He did promise they would not prosper. "Greater is He who is in us, than the evil one who is in the world." 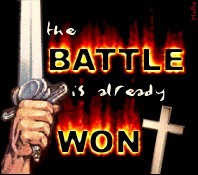 By the power of the Lord, His weapons of warfare and mighty armor, the enemy is a defeated foe. Recognizing the schemes of the enemy will help save souls from heartache and despair. Be watchful and prepared for the Lord's return at all times. We must work for Him while waiting for Him and never grow weary in well doing. In due season, we shall reap if we faint not. We know not the day or hour of His return, but do know He will come again soon just as promised. We are winners with Christ and the victory has already been won! Remember the old saying which is so true, "if God brings you to it, He'll surely bring you through it!" With Jesus as our Captain and Lord, the battle is already won. continue reading "Defeating the Schemes of the Enemy"
and the process about to begin. and long-forgotten issues of pride. as each new day starts. all the clutter that you'd rather hide. when you seek out the light of His face. Grace be to you, and peace, from God our Father, and from the Lord Jesus Christ. Blessed be the God and Father of our Lord Jesus Christ, who hath blessed us with all spiritual blessings in heavenly places in Christ: According as he hath chosen us in him before the foundation of the world, that we should be holy and without blame before him in love. continue reading "Your Spiritual Closet"
Recently, I requested the book, 'Why Did God Give Us Emotions?' from B & B Media. The subject of emotions has always intrigued me and I was very eager to read a book based on emotions, but written from a Biblical perspective. Reneau focuses on 4 aspects of emotions: subjective, physical, mental and spiritual. He also encourages the reader to recognize how these aspects of our emotions interconnect. The subjective nature of emotions: This includes how they make you feel, how they focus your energy and attention and how they urge you to take actions to obtain the things you want and avoid the things you don’t want. This aspect of emotions also includes the experiential understanding of events and concepts that is much more powerful than simple knowledge. The physical side of emotions: This includes the various parts of the brain associated with emotions, the physical reactions they cause in your body and the ways injury, illness or other malfunctions of the brain can affect how you think and feel. The mental side of emotions: This includes the role that your thoughts and beliefs play in generating emotions and how emotions, in turn, affect your thoughts. The spiritual side of emotions: This includes the way emotions reveal both your true character and the nature of your relationship with God as you struggle to live in a broken world. It also includes the way emotions give us insights about the nature of God. 'Why Did God Give Us Emotions?' had my attention right from the preface. If you are looking for a book that actually addresses the issue of emotions from a Biblical perspective you have found it! 'Why Did God Give Us Emotions' is an excellent resource for every Christian's library. Reneau has included in-depth Biblical research, as well as questionnaires that will help the reader to evaluate his/her own emotions. The author also includes a group study at the end of the book. As you read the book, allow the Holy Spirit to use this tool to do a work deep within your heart. Become ALL that God has designed you to be! continue reading "Why Did God Give Us Emotions?" The ticket includes attendance to the live online event and the audio MP3s of each session. So, don't worry if you can't make the live sessions. Purchase your ticket and have all the information emailed to you after the conference is complete. Then, you can listen to it at your own convenience. 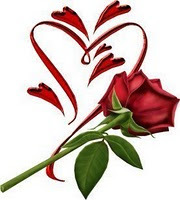 continue reading "Nurturing Creativity& Efficient Life Online Conference 2010"
continue reading "I Love You ~ God"
...so He can heal them. continue reading "God Makes 'All Things New'"
Are you still trying to fill that GOD-shaped hole in your heartwith anything & everything, but God? continue reading "Why Are You STRIVING?" In these tough economic times when companies are downsizing, outsourcing and capsizing, it's hard to find the perfect job and, by "perfect job," I mean any job that comes with benefits...like a paycheck. That's why I suggest you apply to Bigger King, whose motto is: Have Work Your Way. I know what you're thinking. You're thinking, "Great, another start-up company that's gonna go under after three months." Trust me, Bigger King isn't going anywhere but up. They've been servicing customers for centuries. Here are a few reasons you should consider going to work for Bigger King. He forgives all your sins: If you mess up, don't worry. Our boss at Bigger King isn't a screamer. He expects perfection, but gives you plenty of time to grow into the job. We had this one employee, Paul, who, no matter how hard he tried, couldn't do the right thing. Even said as much in his letters. The boss promoted him anyway. Moved him from a small territory in Asia to the regional office in Rome. This gives you some idea of what a great guy our boss is. Heals all your diseases: We have a great medical plan at Bigger King. If you get sick or injured, don't worry. Our boss will take care of you. Even if you get deathly ill and can't work, he'll stay right by your bed, encouraging you to get better, reminding you that you're loved, missed, and that your work is important to him. Redeems your life from the pit: If you think your last job was the pits, you'll love working here. You can do any work you want. Seriously. Even if you stink at it. Our boss provides all the training and education you'll need. He places a lot of emphasis on heart, so if you think you can, with him, you can. Crowns you with love: The boss remembers your birthday, name, your kid's names, and anything that's important to you. Plus, if you need a hug, shoulder to cry on or ear to bend, he's there. His door is always open. Crowns you with compassion: He knows how you feel and understands how hard life can be sometimes. Even though he owns the company, he once pretended to be a common laborer and took a job in his own company as a carpenter. Before long, he was right back at the top, leading, teaching and helping others. When the boss man says, "I know how you feel," he really knows you feel. Satisfies your desires with good things: You don't have to "settle" for any old job. The boss man wants you to have a good job. That's part of Bigger King's mission statement. "I came to give you abundant life." Your youth is renewed: We have a great fitness and wellness program. It's called work. No one gets laid off, takes a "package," or retires. Work with us and you'll die with a smile on your face doing what you love doing. There you are. The basic package at Bigger King. Don't ask what it pays. Your needs will be covered. Ask instead, "where do I sign up?" My son stood, hands clasping his cheeks, mouth open. He'd forgotten again. The kid was notorious for leaving something at home. One day it was homework, the next a book-always something. We'd just pulled up to the front of the school when he realized he'd left his saxophone at home. He climbed out of the car and headed up the sidewalk, expecting me to run back home and bail him out... again. But no more. He'd forgotten for the last time. It was time he learned to remember the benefits of keeping up with things. I forget a lot, too. I don't mean to, but I do. I forget the discernment God gives me when there are important decisions looming. I forget to say thanks for a friend who's health has been restored. I forget that I wouldn't be where I am today if God hadn't bailed me out of a bad marriage or helped me deal with my son's disability. I forget, too. He remembers what is important and forgets the sins we confess. He wipes away the memory of my mistakes and loves me anyway. I don't deserve it, but He does. He's just that way. I didn't go back to the house and my son received a failing grade because of his forgetfulness. But eventually he did learn the importance of remembering. So have I. These days I don't just pray, I write my prayers because it prevents me from forgetting the benefits of His faithfulness and how immense His forgiveness is. It reminds me to praise Him continually for the vastness of His love. It's never too early to forgive others and never too late to remember his goodness. When you start your day...remember his promises of protection. When the clock strikes noon...remember his promises of provision. When you crawl into bed... remember his promises of love. And when you think of that person who's disappointed, offended or hurt you, forget it. As His children, we have more important things to remember. Eddie Jones and Cindy Sproles are friends and co-founders of ChristianDevotions.us. You can listen to them each Friday evening at 7:00 p.m. on He Said, SHE Said Radio! Has the busyness of life strained your relationship with God? He Said, She Said Devotions can help. This devotional duet offers two perspectives from one verse; His and Hers. He Said, She Said Devotions provides personal insights into biblical truths from the unique perspective of one man and one woman. No matter if you are newlyweds or newly retired, He Said, She Said Devotions can put the spark back into your love for the Lord. continue reading "HE Said, SHE Said"
I first heard of this book months ago when I was watching one of my favorite Christian programs, Life Today. I was extremely touched by Karen's transparency about the loss of her husband and how God has used this tragedy in her life to draw her closer to Him. When I joined Thomas Nelson Book Review Bloggers (now Book Sneeze), this was the first book that I chose to review. I wanted to read Karen's 'whole' story, not just hear 'bits and pieces' from an interview. Needless to say, I was not disappointed. In reading the book, Karen opened her heart to share the trials and the triumphs within their lives. With an unexpected death, we all have questions that we would like to have answers to. Karen was the same. She shares her grief with transparency, as she looks to God for the answers. I really appreciated her open-ness in sharing the 'little things' in her life that most people would see as 'coincidences' - but they were really GODincidences - God showing her that He was all around...and truly comforting her during her time of sorrow. "Where was God on Mount Hood?" you will need to read the book to find out. because Karen knows the answer! I received this book free from Thomas Nelson Publishers as part of their BookSneeze.com book review bloggers program. I was not required to write a positive review. The opinions expressed are my own. I am disclosing this in accordance with the Federal Trade Commissio's 16 CFR, Part 255: "Guides Concerning the Use of Endorsements and Testimonies in Advertising." continue reading "Holding Fast: The Untold Story of the Mount Hood Tragedy by Karen James"
that it is God who is shaking them. continue reading "Shake the Foundation!" to help you experience personal revival. - each & every week! If you are feeling desperate in your spiritual walk, then you will want to listen to Pastor Catt share from his own life and how the crises we face must drive us to God. If you enjoyed the podcast by Dr. Michael Catt - 'The Power of Desperation', be sure to check out the wide selection of podcasts available at Infuse Podcast. Dr. Michael Catt is pastor of Sherwood Baptist Church in Albany, GA and the author of a new book, The Power of Desperation: Breakthroughs in Our Brokenness He is also the executive director of Fireproof. What could be good about being broken? It's the perfect time for God to empty you of "you" --- and fill you with Himself! For anyone who needs divine strength in moments of absolute weakness, Catt finds treasures at "rock bottom." Using Biblical and real life stories, he shows you how to trust when you want to panic. At Christian Book Distributors, you can also view a promo video by Dr. Michael Watt, as well as see the table of contents, excerpt, author interview and editorial reviews. continue reading "Gifts Jesus Would Have Approved"
to help you during this difficult time. * Everything's Going to be All Right! * How Do You See Yourself? * Is Stress About to Get You Down? * Keep On Keeping On! in each issue of Enjoying Everyday Life magazine. continue reading "Encouragement in Difficult Times ~ The POWER of HOPE"
What are you speaking to your child? OR negative, demeaning and destroying words? Are you agreeing with what Father God has to say about your children? Are you agreeing with what the enemy of their soul is saying? It's time to bond with your child and to inspire them to know that they are Thumbbuddy Special. Simple tools and ideas to empower your family! continue reading "I Need...to be Loved"
Teri Lynne Underwood, from Pleasing to You invites you to join her in making a commitment to pray for your church. As a pastor's wife, I often find myself praying for God to bless our church, to grant our leaders wisdom, and to bind us together with one heart. And yet, I believe it is not just those of us who are called into or marry into pastoral ministry that are called to pray fervently for the Bride of Christ. I imagine though, that many are uncertain how or what to pray for their local faith fellowship. In studying the Book of Acts, I realized that much emphasis is given to prayer...and that, I am convinced, is a large factor in the enormous impact those believers had in spreadint "The Way." So, I began to ask God to show me how to pray effectively for my church using the early church as an example. This project is a result of those prayers. The idea is to devote a minute to each prayer. 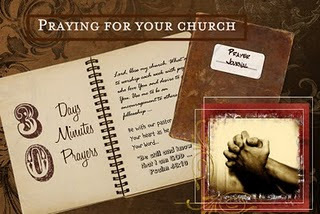 This can be done cumulatively in order to build up to devoting 30 minutes a day to praying for your church or simply as an addition to your prayer list daily ~ devoting a minute to a specific prayer for your church. However you choose to use this, I pray that God will bless your desire to pray for your church...and bless your church as you pray. Use this guide, 30 Days, 30 Minutes, 30 Prayers ~ Praying for Your Church to help you to pray consistently for your church, your pastors & church body as a whole. 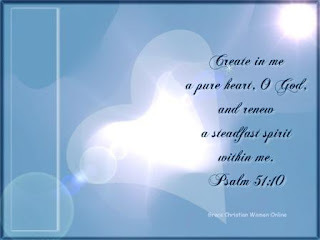 Be sure to visit Terri Lynne at Pleasing To You; her heart's longing is to live a life that is pleasing to God. Psalm 19:14 is the cry of her heart. Please join her on her journey to becoming MORE like Jesus. continue reading "Praying for Your Church ~ 30 Days, 30 Minutes, 30 Prayers"
For the rest of January, Christian Audio is offering John C. Maxwell's series of leadership audio books for ONLY $2.98!!! Each ONLY $2.98 until the end of January. No coupon code required! Download each of the Leadership 101 Series titles for only $2.98 each until January 31st. continue reading "Thought You Might Like to Know..."
Or would rather be living it some other way? Or wish for something that's different or new? And has brought much happiness into your heart! And that's what contentment is all about! We'll find we have plenty, there is nothing we lack. Then contentment and joy, with us will stay! I "just knew" I needed to read it! And what a read it was! This book is definately a keeper! The Toilet Paper Entrepreneur had me laughing, right from the get go! It is funny, inspiring and includes many top notch ideas that will help you get your business rolling! You will read many testimonials from other Toilet Paper Entrepreneurs, as well as hear Mike Michalowicz's own story. You will build a relationship of trust with the author because he's a toilet paper entrepreneur who has 'been there; done that'. Mike's honesty about his own journey of success in business is encouarging and highly motivating! He has a huge heart and he wants to see you succeed with your business. In The Toilet Paper Entrepreneur, Mike Michalowicz shares a 'whole roll' of advice to the reader...not just three sheets! By the end of the book, you will feel like you have met the author face to face; and you will know at least one other person who needs to read this book. If you are looking for a 'get real' approach in business; then this book is for you! The Toilet Paper Entrepreneur will motivate and inspire you to move forward with your biz...regardless if you are just starting out or have been in business for quite some time. Purchase your own copy of The Toilet Entrepreneur. If you would prefer an MP3 version, you can pick it up here. Don't delay! Visit The Toilet Entrepreneur site today! even if you are at the end of your roll." I loved this book; and I HIGHLY recommend it!!! EXTRA- SPECIAL THANKS given to Scott Bradley and Mike Michalowicz for putting this incredible book in my hands! I've met both of these incredible men through online networking (twitter and facebook); and have learned so much from each of them. One day, I hope that we will all have the opportunity to meet in person and have a coffee together. These men have been instrumental with the success that I have seen online - thanks guys! Wishing you both MUCH SUCCESS in 2010!!! p.s. - Thank you both for being so understanding regarding the lateness of my review. I believe that The Toilet Paper Entrepreneur is even more applicable now, with the state of the current economy, than when it was published in 2008. I know your readers will be begging for another book! I sure am! continue reading "The Toilet Paper Entrepreneur"
"Chili and Chocolate Cake is not your average inspirational book; and is as unique as the title. The author shares her message of forgiveness, restoration, and hope for hurting women -- especially those who have experienced the loss of a child through abortion, miscarriage, or stillborn birth. This book is a shining testimony to the power of God to heal the broken heart. Author Joyce Schneider's dramatic life and the miraculous change from a tortured young women to a great woman of God will encourage every reader. God even used the stablilty gained from preparing chili and chocolate cake to weave the thread of His grace throughout her troubled life. Get ready for an outpouring--from the barren days of the past, to springs of living waters; rivers that will refresh long after you close the pages of this book." continue reading "Staying Anchored in the Storms of Life"
Where's Your Trust? God or Man? to go the way alone. continue reading "Where's Your Trust? God or Man?" If you are a person who is growing in the Lord and beginning to acquire more and more of the Promised Land, you will find that the battle only gets worse. The more you grow in the Lord, the more useful you are to Him, and the more the enemy will want to destroy you. If you stay lukewarm and just feel content to sit on the sidelines, you will find that the battle isn't all that bad...but you're also probably pretty miserable, having a taste of what God has for you, yet never possessing it for yourself. It's time to acquire the PROMISED LAND!!! continue reading "The Battle Gets Stronger!" continue reading "Unfolding the Rosebud"
If you haven't seen the Watoto Children's Choir before, you are in for a treat! continue reading "Is Your Load TOO Heavy?" Dallas/ Ft. Worth , TX —In the blink of an eye, life can change forever. Hopes and dreams of what we’ve envisioned our lives would be can disappear in a moment. Tragedy and heartache can instantly pierce the veil that once separated the world we knew and the one we could never have imagined. In his new book, Shattered, Shaken, and Stirred: Reconnecting with What Matters Most After Loss and Adversity, author Gilbert Ahrens recounts his own personal story of conflict, struggle, and suffering in an intimate letter to his young daughter. His story offers strength, suggestions, and encouragement to others who find themselves on the solitary journey of loss that—sooner or later—is the one thing that we all have in common. On a beautifully clear, crisp autumn evening in 2002, while traveling outside Denver , Colorado , Gil’s car was hit head-on by a drunk driver traveling 95 miles per hour. Gil, his wife Kim, sister Margot, and three-week-old daughter Olivia had been going 60 miles per hour. The driver of the other car was only 18, and the passenger in his car was killed instantly. Gil’s family survived but just barely. Among many other serious injuries, the worst was that his wife, Kim, suffered a broken neck that paralyzed her—sentencing her to a wheelchair. Their baby daughter, however, emerged miraculously unscathed. In a split second, the lives of this seemingly ordinary family were upended, disrupted, and derailed—just as they were beginning to learn the ropes of parenting a newborn. They were instantly transported to a new world of “survival”, which then over time transcended to the less dramatic but still unknown world of “coping.” But, in the wake of devastation and anguish is where recovery and, ultimately, redemption are found. In Shattered, Shaken, and Stirred, Gil explores and embraces the process of struggle, brokenness, and healing in a way that is honest, heartfelt, and yet at times, reassuringly humorous. In Shattered, Shaken, and Stirred, Gil tenderly encourages readers with an eternal truth he has learned through personal trial and affliction: When there is hardship, it is for a reason. to raise funds for earthquake relief. and receive 10% off any version of Shattered, Shaken and Stirred. which is providing food and relief to Haitians in need. 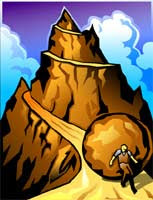 continue reading "Shattered, Shaken and Stirred"
2010 ~ A YEAR OF BREAKTHROUGH! Don't Just Improve Your Marriage...Transform It! STOP Digging Up Those Bones! "Lord, Help! I'm Married to a Fool!"